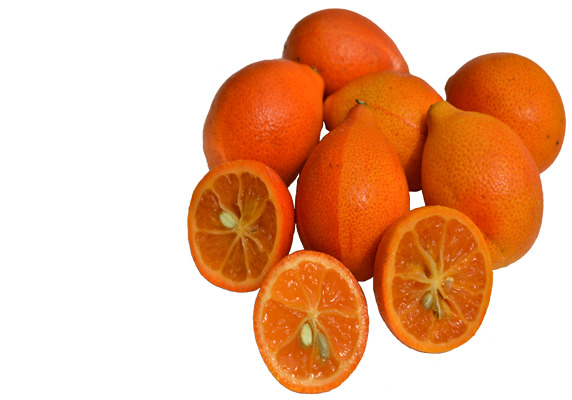 Centennialquats are very similar to the Mandarinquats in size and shape. However, Centennialquats tend to have variegated colors on the rind, which is less pronounced the deeper the orange color becomes. Also, the flavor is more tart than that of the Mandarinquat, but still has that "mandarin-like" taste. So, if you like the juicy-tart citrus taste in a small little flavor packed kumquat size piece of fruit, then you will really enjoy Centennialquats. Like kumquats, Centennialquats are usually eaten whole, peel and all, however they do have small seeds. Best part of Centennialquats are how versatile they are. Think of all the great ways you can use them in your kitchen...you can eat them as is as a healthful snack, or sliced up in salads for that added "zing" of flavor. Of course they are awesome when used in preserves or purees. The juice can be used in marinades or cocktails, and even made into syrup. And think of how flavorful a vinaigrette salad dressing would be with that tangy citrus flavor. Yum-O! Centennialquats will keep up to two weeks when refrigerated. Centennialquats have a rather short harvesting season. They are typically available January thru May. Due to availability and short season, annual market pricing will also vary from season to season. Pearson Ranch sells it's Centennialquats in 5 pound Quantities. For more 10 pounds or more, please call for details.